We *FINALLY* have a Trader Joe’s here in Medford! I cannot tell you how excited/happy I am about this. When I lived in Portland I didn’t shop at TJ’s every day or anything, but it was a really nice store to have for some really specific things. I had two TJ’s pretty close to where I lived and I clearly took it for granted. When I moved to Medford 3 years ago I began to sorely miss my TJ’s! One of my dear friends would bring us treats from TJ’s when she would come to visit. I have even contemplated driving all the way to Eugene (about 3 hours) just to shop at TJ’s. Now…now I don’t have to! There is a new Trader Joe’s that opened just a couple miles up the road from me. Yesterday was the grand opening. Chris and I went this morning to check it out and buy a few things. It was a madhouse! People and carts everywhere. I can’t even imagine how much money they are raking in this weekend. This TJ’s is smaller than the two in Portland that I am used to, but they still have a nice selection. Of course, some things are quite a bit more price wise than one would pay elsewhere, but other things are very inexpensive, so I guess when it comes to shopping there it is a matter of knowing what to buy there and what to buy elsewhere. 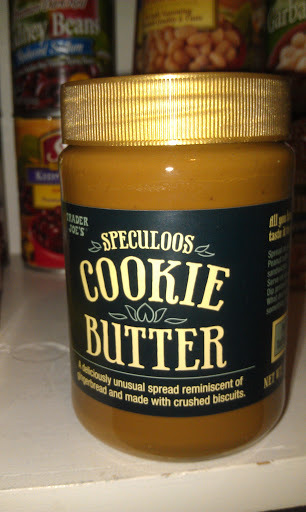 I think I heard angels singing when I put the cookie butter in my cart…. Some pre-washed and chopped kale. 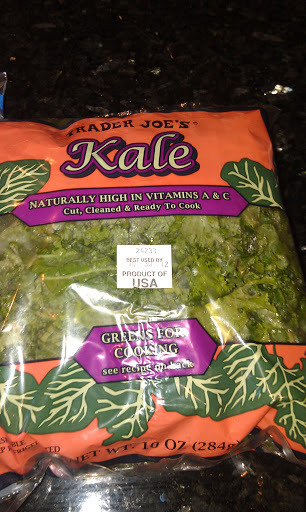 I actually like to add kale to soups and eggs and so forth, but for some reason I hate to clean and chop it, so I never buy it. This will be great for me because I will totally use it! Wild Rocket, otherwise known as arugula. 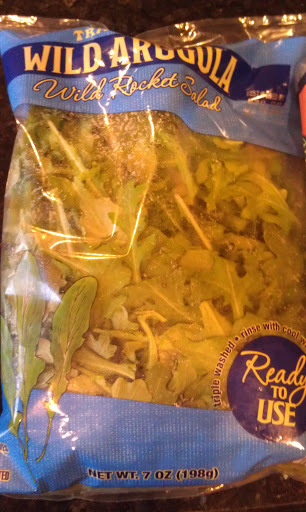 I have a very yummy recipe that calls for arugula and I was just thinking of making it the other day. Now I have a key ingredient! I feel the same way about leeks that I do kale! I love it, I like to add it to my food, hate to clean it. 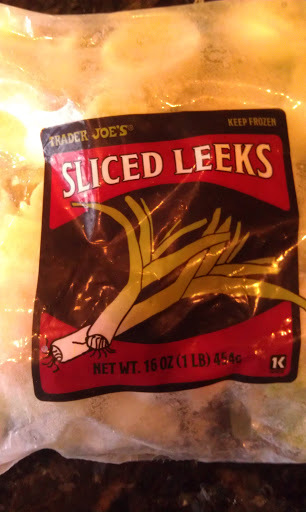 This is pre-washed and sliced frozen leeks! How easy will this be! Heaven! Couldn’t leave our first TJ’s trip without some Carne Asada! 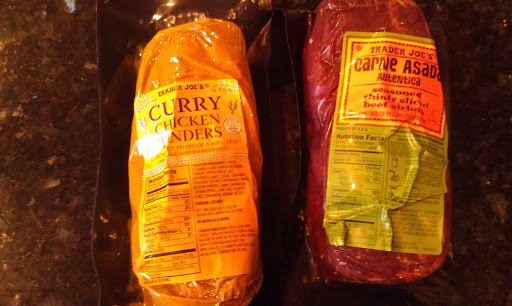 We picked up some Curry Chicken Tenders, too. Both look good and a glance at the ingredients: no sugar! The asada does have wheat, but no sugar. Score! 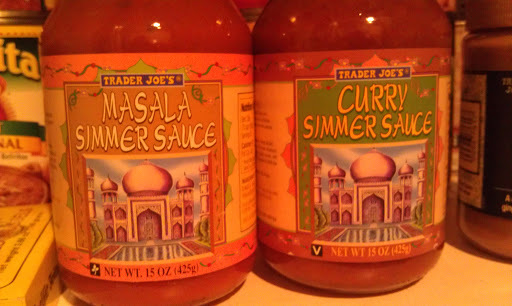 We also picked up a couple of simmer sauces, Masala and Curry. I will eat them just with veggies, or on shredded zucchini or spaghetti squash. Chris will likely have them over noodles or rice. These, too, don’t have sugar! YES! I’m so excited. I did buy some Thai Lime and Chili Cashews, but didn’t snap a photo. They are my absolute favorite nuts. I’m not eating nuts right now, but I will be so looking forward to breaking that bag open and having a few. Of course there was tons of 2 buck Chuck, but I didn’t buy any of that either. I kept reminding myself that the store wasn’t going to be closed tomorrow. I didn’t have to buy everything that I want all at once. I’m so excited to have Trader Joe’s here in Medford and I know I will be stopping in regularly to supplement my regular grocery shopping. Now…if we could just get a HomeGoods! Do you shop at TJ’s? What is your must-have item? 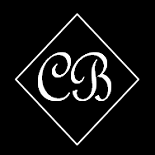 This entry was posted on October 21, 2012 by Corrie Beebe in food, reviews.